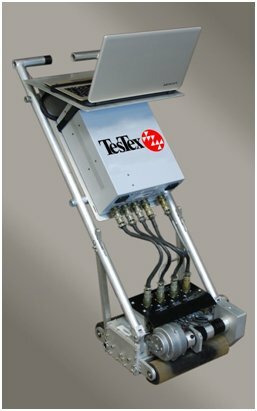 The Falcon S Series is a tank floor scanner based on Saturated Low Frequency Eddy Current Technique. It scans tank floors by saturating them with an electromagnet and then uses Eddy Current to detect defects in the plate as it scans over it. With this technique we are able to detect pits, holes, cracking, and wall loss, and differentiate the orientation of the flaw depending on if it is a top side or bottom side flaw. This scanner is the latest in tank floor scanning technology. The underlying technology is what makes this scanner a better tool for sizing flaws. LFET is better suited to detection than sizing, and is an excellent option for some of our client’s needs. The Falcon S Series uses similar technology to our Mag Wave system, in that it brings Eddy Current accuracy to Ferrous plates. The highly sensitive nature of eddy current allows the scanner to detect and size top side and bottom side pitting, and localised wall loss. Additionally, The Falcon S Series can detect cracks. One other exciting feature is the ability of the Falcon S Series to scan through non-metallic coatings of up to 12mm.